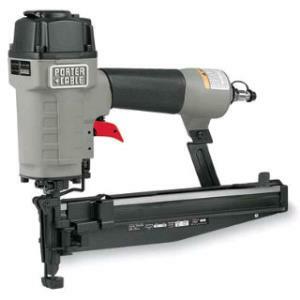 This Porter Cable 16 gauge finish nailer uses straight stick nails. It can handle sizes from 3/4" - 2 1/2", and features depth of drive adjustment, muffled exhaust port, which is adjustable enabling you to discharge in the direction you choose. We sell the nails for this in store. * Please call us for any questions on our finish nailer pneumatic rentals in Hillsdale and Ridgewood NJ.